Over the years, we at Toronto Home Theater have been lucky enough to win the “Best Of” Award at HomeStars 9 times. Well, maybe not lucky: we haven’t changed our customer approach because it works. Toronto Home Theater Profile Page on Homestars.com. Winner of the “Best Of” 9 Times! We keep the home theater lingo simple and to a level of understanding for each client, so there’s never any jargon that our clients don’t understand. We want to make sure that our customers are fully aware of the service they’re getting and are never left confused. All questions about pricing and products are answered with integrity, and we always leave every home that we service with the goal of having them tell their friends and family that we’re a ten-out-of-ten in our field. While referrals and repeat business certainly makes up a lot of our annual sales, there is no doubt that over 60% of our business comes from new clients who looked online and found HomeStars as a place for them to confirm our reputation and see what others are saying about their experience with Toronto Home Theater. We are proud to be listed as a “Verified” Business on Homestars, as this is just another layer of credibility that matches up well with who we are. That way, homeowners can feel confident when inviting us into their homes to provide them with quality service. Why is Being “Verified” on HomeStars Important? For over a decade, HomeStars has been instrumental in helping homeowners find and hire only the most trustworthy and reliable service professionals out there. As such, homeowners are better able to make more informed decisions about who they bring into their homes to provide them with the services they’re paying them for. 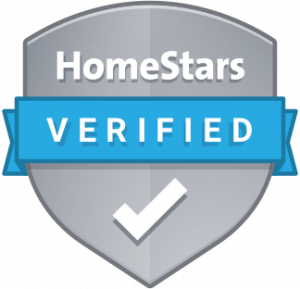 Now, HomeStars has recently introduced the “HomeStars Verified” badge that service professionals can boast. A Verified badge can be considered seal of approval for homeowners so they can be confident that they are hiring a professional that comes backed by experience as a trustworthy entity. We at Toronto Home Theater are proud to feature a Verified badge, which essentially means that all of our requirements have been checked and verified by HomeStars, giving homeowners the peace of mind needed before bringing any service professional into their home. When you hire Toronto Home Theater to get your home entertainment makeover, you’ll have the benefit of knowing that the service you’ve hired is backed by a reputable entity like HomeStars who’s business it is to look out for the homeowner.